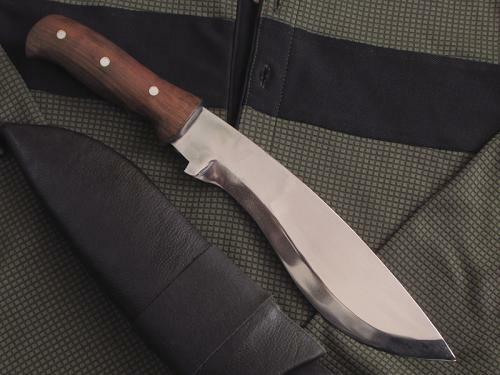 'Bahadur' bowie knife is dedicated to the Gurkhas to depict their brave character..
BAHADUR (COURAGEOUS) is actually a copy version of a custom-designed bowie knife made by “Khukuri House Handicraft Industry- KHHI” for one of its customers. Since its features resembled the shape and style of a kukri, KHHI also started producing on its own for resale. A complete new name “Bahadur” which is one of the most common middle names of a person in Nepal is given to identify this knife in a customary way. “Bahadur” in Nepali means brave and courageous which this work of art truly deserves and discloses, and thus the name. 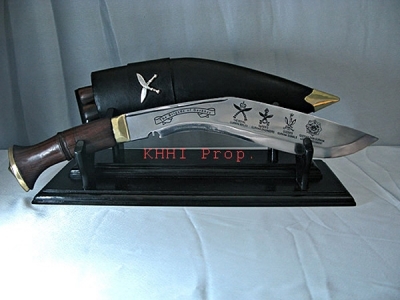 It is also a genuine effort by KHHI to dedicate this knife to the Gurkhas, as most of their middle names have Bahadur since immemorial, which truly depict their character. The shape of this knife is slightly curved with wider surface at the front section. The bevel of the knife is larger than regular ones which advances the cutting ability. A pointed nozzle pops out of the blade that works as a blood dipper. The handle is the strongest point; a unique distinct handle where the metal of the blade in the handle area is flat, not narrow and pointed as in other knives. The blade is therefore visible all around the handle. The two handles are firmly glued to the tang and further joined strongly by aluminum rivets that can also be seen at the sides. Unlike typical khukuri handle, the front-edge contour and curve is made to fit the palm of a user in a most comfortable and best possible way. The curve resistance designated for the index finger facilitates a stronger grip and easier handling. Bahadur Bowie Knife has a special embossed (pattern) buffalo leather (also seen in the picture) scabbard but the basic tools (Karda & Chakmak) are discarded. A lanyard loop is fitted in the tip of the sheath for a string/cord to go through to tie around thigh so wobbling can be minimized when in full motion.